Despite running an organized and effecient army, Adolf Hitler's war machine couldn't quite compete with the Allies when it came to the factory. “Hitler’s generals, raised on the dogma of Clausewitz and Moltke, could not understand that war is won in the factory.” — Joseph Stalin, 1949. The development of mechanized fighting forces as a key element of modern warfare underwent a major transition during World War 2, as determined by the numbers of motor vehicles and armored fighting vehicles (AFV) built and engaged. Mechanized capabilities were determined based on industry, leadership, and the quality and types of vehicles and AFVs, along with the capabilities of a nation’s people. While the German army was well organized and efficient, it was not the war machine it could have been. While an innovative and outstanding force early in the war her enemies made improvements, using hard won time to make changes and apply what they had learned, while flaws in the German war machine became more apparent. A basic weakness of the German war machine could be found in the German population. Although they could produce excellent machines and products, Germany lacked a large populous that was sufficiently technically advanced. There were also problems in manufacturing. The German automobile industry found itself unable to produce the wheeled vehicles needed to support mechanized forces. The outbreak of fighting quickly magnified deficiencies. Shortages of trucks were experienced as early as the Polish campaign. 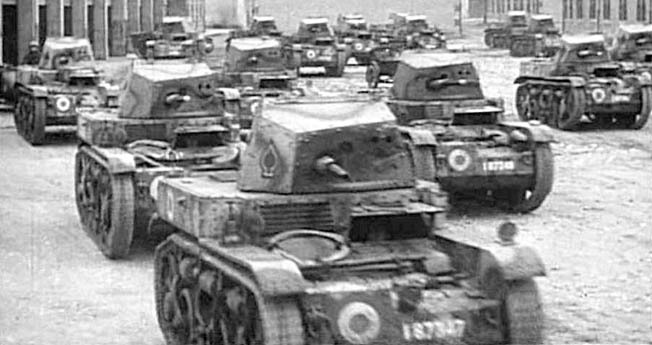 After the defeat of France a number of French army vehicles were pressed into service in order to provide for the expansion in the number of panzer and motorized divisions. Despite this, as the German army entered Russia it continued to be dependent on horse-drawn wagons and carts. Only eighteen percent of German divisions were fully mechanized in 1940-41. The Germans came to the realization that what made a combat unit more effective was its mobility rather than its firepower. Thus, motorized infantry divisions were as useful as panzer divisions. The German economy’s inability to produce the quantity of vehicles needed for the entire army was a key reason for creating the panzer divisions, as well to the sudden and rapid expansion of the army. This resulted in the German army being organized into a small, motorized force and a large, non-motorized force. The Germans built just 50,000 armored fighting vehicles during the war while the US and Russia built thousands more. One of the reasons for the disparity was that the Germans focused on qualitative advantages rather than quantity. They never adopted the manufacturing practices that enabled the Allies to churn out huge numbers of tanks. German tanks were considered superbly engineered vehicles, but the Mark V Panther tank took 150,000 man-hours to build. The Tiger, with over 26,000 parts, took over 300,000 man-hours. German tank production was also hurt by the large number of variations or models. In the end, Adolf Hitler did not possess the type of economy necessary for the creation and maintenance of a large mechanized force. Even if the needed number of tanks and vehicles could have been produced, synthetic oil production and Rumanian imports were insufficient to support Germany’s armored force. The inability of the German economy to keep the army even moderately equipped forced the use of foreign equipment as well as a heavy reliance on horses for transport. This dependence increased as reverses on the battlefield and in the air war created shortages of both vehicles and fuel. The Germans built excellent AFVs, but failed to address the larger picture of fielding sufficient mechanized forces. Tags Adolf Hitler, armored fighting vehicle, Joseph Stalin, Panzer V Panther, Tiger Tank, war machine. German’s are a smart nation, They still can the same to day as they did more than 70 Years ago.